Thankfully the rain had stopped by the time we got up this morning and we had clear skies to begin our walk to Chomrong. 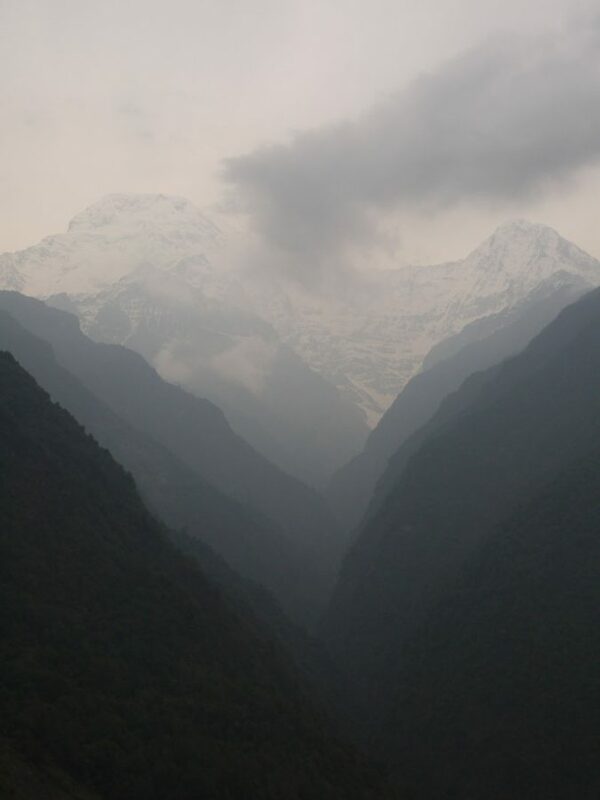 At this point the trail splits in two; north-east to Chomrong to join the Annapurna Base Camp trail and south-east to Ghandruk to finish the Ghandruk Ghorepani circuit trek. Heading north-east, we said goodbye to other hikers we had met along the way and left Tadapani behind us. 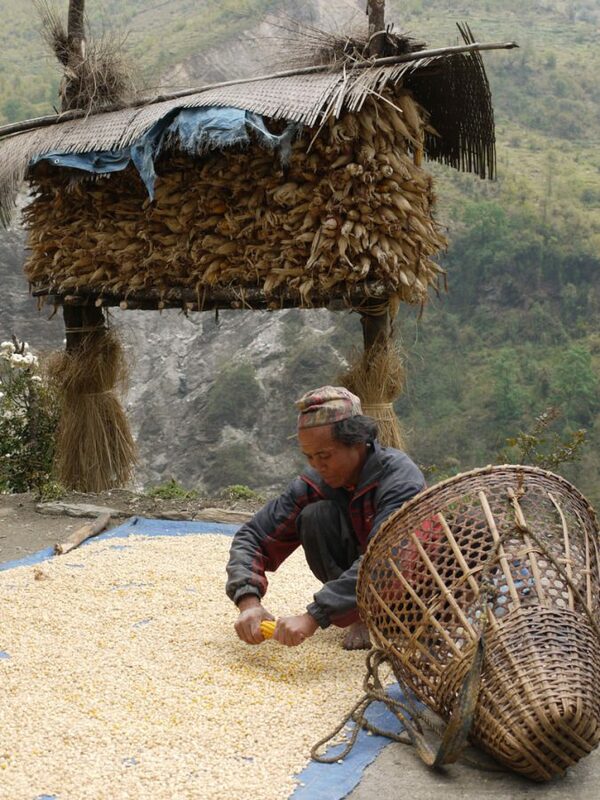 The path dropped steeply down the mountain, through a forested area to a tiny farming village, Chuile. Walking by, we watched an old local man shave kernels of corn from the cob and a younger guy try in vain to gather his sheep and goats together. 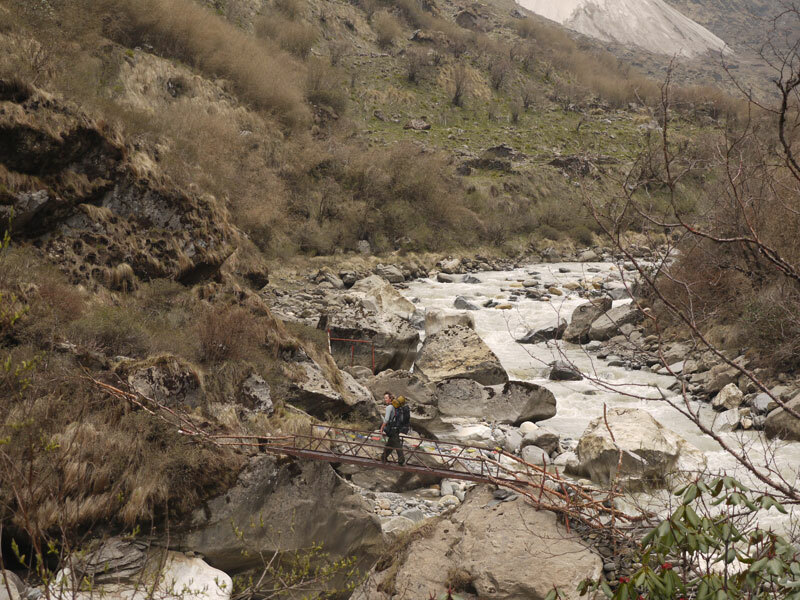 We reached a rickety wooden bridge the bottom of the valley, crossed the Kimrong Khola river and just as the first drops of a heavy shower began we began the short but steep climb up the other side of the valley. Looking back across where we had come from, the green terraced fields cascaded down the mountainside, interrupted by a patch of white spots moving around frantically. 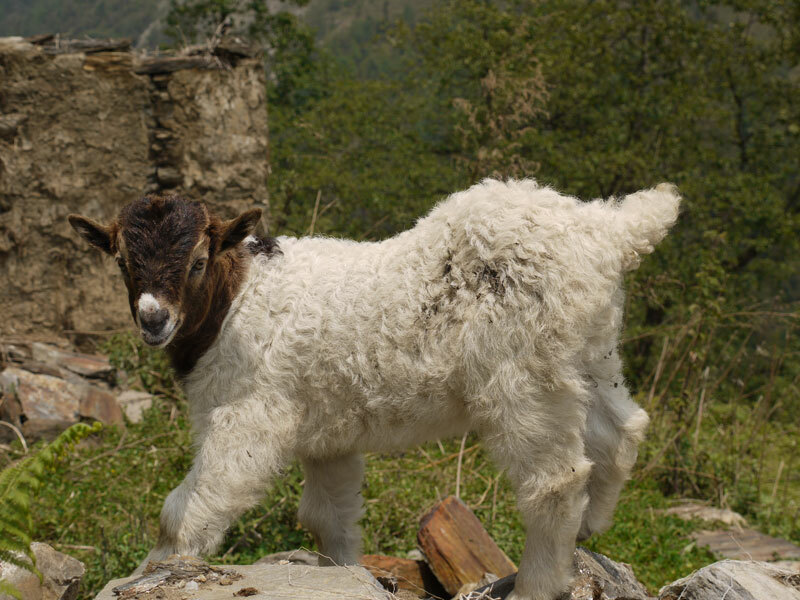 The sheep and goats still hadn’t been brought together, that poor guy had a tough job! We followed the trail along the mountains edge, winding around each bend and came to Gurjung where we stopped for lunch. At the same restaurant was a family who we had been passing on and off for the last two days and who we had stayed with at the lodge in Tadapani last night. When we were finished our lunch we continued together to Chomrong, taking in the views of the vast green valleys to the right of our path. From Gurjung the trail climbed up before leveling out and the blue roofs of the guesthouses in Chomrong came into view. We followed the steps down, stopping to scope out tomorrows path across the valley. We checked into a nice lodge with a great view and sat around all evening listening to the two young girls, Fia and Tamsin, tell stories about their travels in India, taking off the Indian accent excellently! Their parents, Guy and Jacqui, backed up all their tales and added more, telling us about their sometimes funny and sometimes sad stories of their experiences in India, China and Tibet. Two Swiss guys, shared stories of their Annapurna Circuit trek, which they were finishing and together we laughed and talked until the late hour of 8:30pm and then it was time for some rest. As we left the dining room the sky it up with a massive flash of lightning and the rain came down hard on the galvanised roof of our Himalayan tea-house. 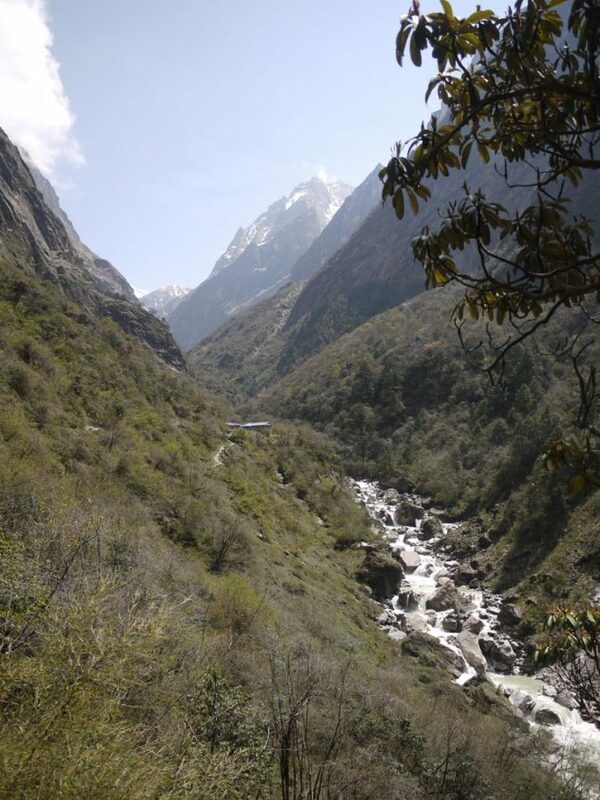 It was uncomfortably hot this morning, walking down the stone steps from Chomrong to the river below. We plodded along in the morning heat with Guy, Jacqui and the two girls towards the small village of Sinuwa on the other side of the valley. We walked along as the two girls educated us about all the Hindu gods and tried to teach us how to count in both Hindi and Chinese. I must stress they tried to teach me but in the morning heat it was hard to concentrate! Together, we crossed a wooden suspension bridge and continued up the steep stone steps to Sinuwa, where we parted ways for now. The path continued to climb steeply for another hour, not easy in the hot morning sun. A herd of mules took a moments break from grazing in the shade of the trees to acknowledge us as we passed and finally we reached our highest point of the day at 2,540 meters. From here we could see the valley ahead winding through the mountains that will lead us to Annapurna Base Camp over the following days. Thankfully we saw the path lead downwards through a forest and into some much appreciated shade. We talked and walked along the relatively flat path, winding on, with bamboo to our left and a long, long drop down to the valley floor below to our right. In front of us, all of a sudden, something quite big went running across the path. We approached quietly looking carefully up amongst the bamboo and we saw a big monkey looking straight back at us. Its back face, surrounded by white fur, like an Eskimos hood, was expressionless and it quickly turned and scurried, cat-like, up the hill and out of sight. Carrying on out of the forest we followed the trail down to Bamboo, the small village where we planned to stop for lunch. As we arrived, huge drops of rain slowly began to hit the ground and in no time at all the sky had turned black and it was pouring rain. Setting our packs down, we ordered lunch and waited for the rain to stop. We had plans to hike another three hours to reach Himalaya and so we sat waiting for the rain to clear. Two hours later, we gave up on the rain clearing and got a room in the same tea-house where we had had lunch. Re-appearing moments later in fresh clothes, the rain had of course stopped by now it was too late to walk any further. We went for a stroll around the village and heard two young voices calling our names from the doorway of another tea-house. It turned out not everyone had been lucky enough to avoid the rain! We joined the two girls and their parents at their tea-house for a while before our lodge owner came to find us in time for dinner. Even though we had only waked three an a half hours, the heat had really taken it out of us early on and so planning an early start for the morning, we called it a day. The landscape changed dramatically today hiking from Bamboo to Machhapuchhre Base Camp, climbing a total of 1,390 meters in altitude! We got an early start, walking out of Bamboo just after 6am on an empty stomach, headed for the next village of Dobhan. The path wound through dense bamboo forest and it was wet and muddy underfoot after the heavy rain yesterday. The river below was loud and looking down at the churning whitewater, we spotted small macaque monkeys playing in the trees along the river bank. 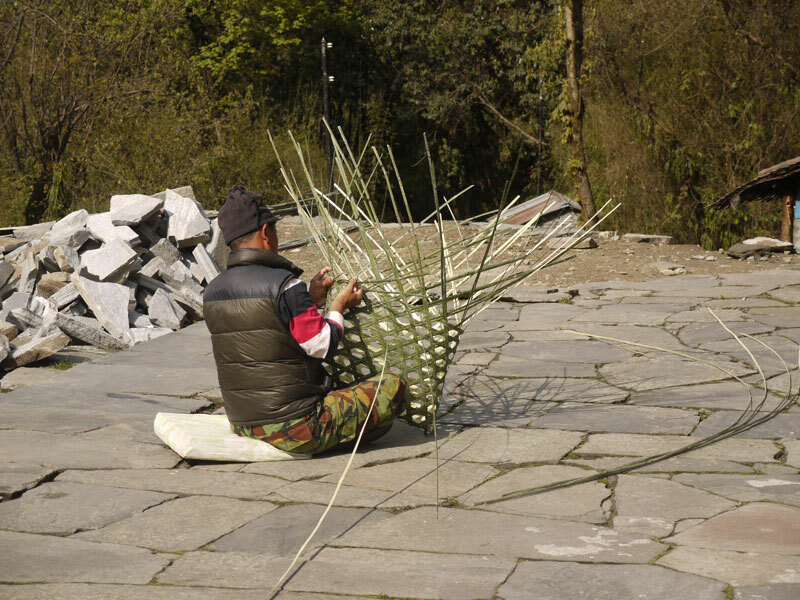 After an hours hike we reached Dobhan and while waiting for our breakfast we watched a man weave a basket from long strips of bamboo, which he would no doubt use later to carry loads from village to village. The next village on our trail was Himalaya, where we had hoped to reach yesterday, and so we continued uphill through the rainforest-like surroundings, 320 meters up from Dobhan. The sun began to shine through the trees in places and the forest looked stunning. Green, mossy vines hung from the oak trees and long bamboo stalks grew up from all sides. The roots of the trees formed steps in places and the uphill hike was really enjoyable. 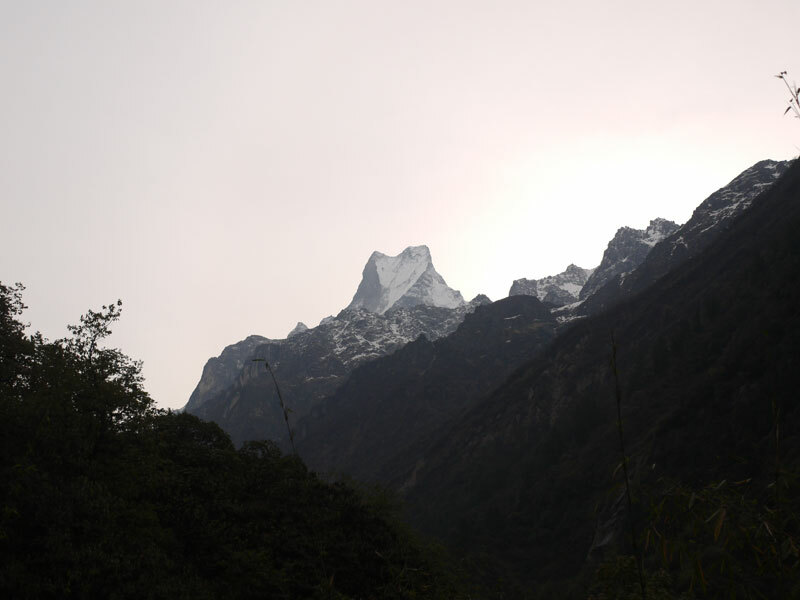 After some time, stone steps began, spiraling up the mountainside out of the forest, bringing us to Himalaya. The mountains were closing in close around us now and after a quick break we wandered on up the trail. To our left and right were huge mountains and walking up between them we saw huge waterfalls on both sides of the valley. The water cascaded down the mountainside powerfully, cutting through the path in places, where we had to carefully cross on stepping-stones. An hour and a half later, shaking with the hunger, we arrived in Deurali. At an altitude of 3,230 meters, we had an amazing view back down the valley we had hiked through. We demolished our lunch, talking with other hikers and as our tea arrived, so did the family we had been walking with for the past few days. The rain tends to start in the mid afternoon everyday and it was now after 2pm. Everyone at the lodge was chatting and laughing away together, having a great time. We had one more leg to go and although we were tired and there was a good chance it was going to rain, we decided to push on to Machhapuchhre Base Camp (MBC), two and a half hours further on and another 470 meters uphill. We said goodbye to everyone before we were tempted to stay and hit the trail, refueled. 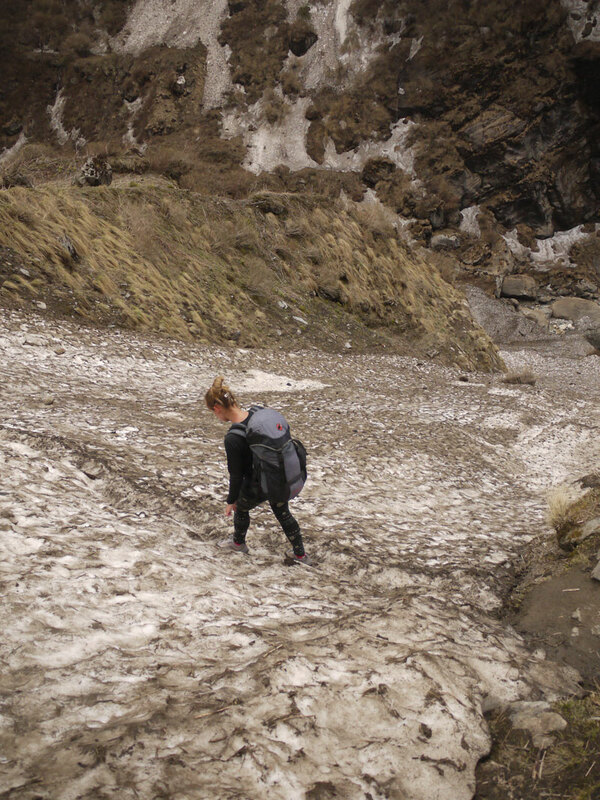 The path from Deurali to MBC is notorious for avalanches and the walk was a little nerve-racking at times, especially since there wasn’t another soul in sight. A dog accompanied us along the trail and led the way, finding the path whenever we were unsure of the way. The trail led north along the river. We had to step across stones and negotiate some extremely dodgy looking bridges to cross the river, had we fallen in we would have been swept away in a heartbeat by the churning white water but luckily everything went fine. The ruins of Bagar sat on the river’s edge as a reminder of the damage that can be caused by avalanche and high waters, we passed through and continued on through the valley. Ahead of us on both sides were huge mounds of snow which sloped down from the mountainside to the path we were walking on and beyond. Caused by avalanches, the snow was full of debris, big rocks and dirt. The landscape by now had become quite barren with not much vegetation and the sparse surroundings combined with the dangerous avalanche chutes gave the place an uneasy feel. We had to cross a number of these snowfalls, some trickier than others. Noelle crossing the narrow, icy path across an avalanche shoot, careful not to put a foot wrong! It was getting late in the day and a thick mist was rolling in, suddenly we couldn’t see where we had come from and the path ahead wasn’t very visible. 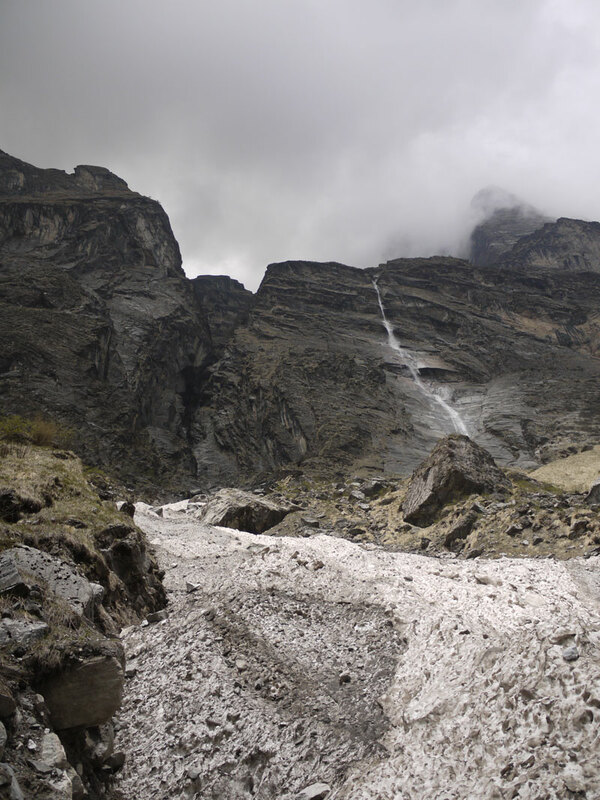 We crossed one avalanche fall and looking up, the huge snow slide disappeared into the clouds high above. Looking down, the steep, snowy slope continued all the way down to the roaring river below, which could be heard clearly, but not seen through the dense mist. Tiredness was beginning to set in, having been walking steadily uphill for almost six hours. Luckily, through the mist we saw the shadowy outline of a guesthouse, we were there! With our last ounce of energy, we made it up to the lodge at Machhapuchhre Base Camp, changed out of our wet gear and began planning our trip to Annapurna Base Camp for sunrise. It’s going to be an early start!